Typically, these companies were almost exclusively B2C. Even to this day, B2B companies are still skeptical of the benefits of social media for their business marketing. The reason for this hesitance is a perceived inability to measure the effectiveness of such marketing activities on social media. Conversely, B2C companies were the “early adopters” of social media marketing. Content is no longer limited to simply words such as white papers, blog posts, etc. It is now also visual, audio and interactive content. Additionally, the messaging within a social media post itself is content. The rules for content marketing include not being overtly promotional. Instead, content needs to provide value to the reader. Valuable content will put your business at the top of their mind when it’s time to make a purchasing decision. In terms of the “classic” types of content, B2C companies should heavily focus on blog content. It is crucial to consider how shareable a post will be when writing blog content. In addition to call-to-action buttons on your blog, there should also be share buttons so that your readers can easily share your content across social media platforms with a single click. The amazing viral effect of visual content can be leveraged by B2C marketers on social media platforms as well. An excellent way to do this is by creating entertaining videos, distributed through YouTube or other channels. Another way to do this is by posting humorous and heart-warming posts. As mentioned above, social media was something completely different than it is today at its inception. Now we see a variety of social media platforms. We are noticing niche social networks which focus on one form of communication or media. For instance, Pinterest and Instagram focus on visuals while Soundcloud is for audio and Youtube is for videos. There’s a wide variety of social media platforms available to marketers nowadays, so it is important to know the most effective platforms for B2B and B2C. The primary standard for B2C social marketing; it was the first social media platform and remains a staple of any effective B2C social media strategy. For B2C, Facebook is an ideal tool for community engagement, customer support and promotion. Twitter is one of the very few “open” social media networks. This means that anyone can see any tweet you create. However, you must understand how to ensure your tweets are getting the most visibility possible. Research hashtags, design creative campaigns and engage with well known individuals in your field. Also, don’t forget to engage with your community on a regular basis! For B2C marketers, visual content is an incredibly useful tool. As a social network focused primarily on pictures, you can utilize Instagram to give a personal face to your company. Take pictures in the office and post them regularly. Selfies are always a great choice. One of the best ways to capture your audience’s attention is through video content. Creating fun and quirky videos is something all B2C marketers need to focus on. Production value is essential. However, but there’s also value to a less polished video, as it gives your company more personality. There are three social media networks (LinkedIn, Twitter, Facebook) that B2B marketers should focus on. However, LinkedIn stands out as the most important. In particular, you can leverage Discussion Groups in LinkedIn as much as possible for not only engagement, but content distribution. When distributing content through groups, make sure that you are not coming off as too promotional. One of the main differences between B2C and B2B social media marketing is lead generation. 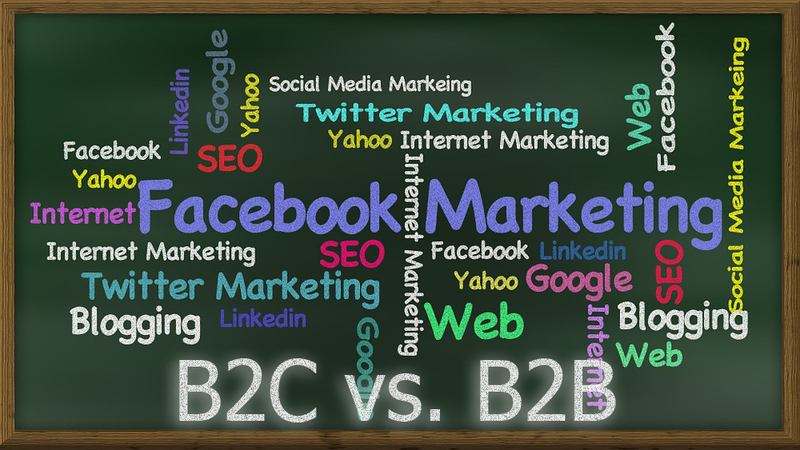 Lead generation is the ultimate goals of B2B social media marketing, while B2C has different goals. Given the typical nature of B2C marketing, B2C social media marketing focuses primarily on community engagement and awareness. The key stone to a B2C social media strategy is virality. Creating viral content is a product of focusing on increasing awareness through social media platforms. The most important goal for B2B marketers when it comes to their content is lead generation, but the number one way they measure their content’s effectiveness is web traffic. While confusing, this statistic shows the perception in the B2B community that there is no way to measure the real effectiveness of social media marketing. Utilizing a social media marketing platform designed for your business, will help you see the direct link between social posting and lead generation. Here at Centennial Arts, we work on developing technology to help businesses grow and connect with their customers. We can assist with your content marketing through our Search Engine optimizing process to ensure your business appears as the top of search results, for both B2C and B2B marketers. Contact us with the link below for more information!